Digital Indicating Transmitter is versatile and designed to reduce installation costs, instrument costs and save space. Housed in a durable fiberglass reinforced thermoplastic case. 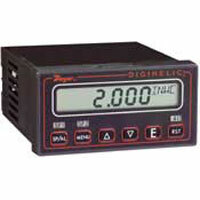 Digital Pressure Gage has a backlight, peak and valley, auto zero and conversion of pressure units. Applications include level control, pump control, process control, and compressor control. 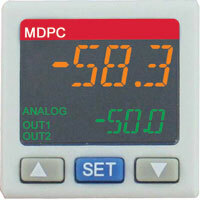 Digital Pressure Gage include a backlight, peak and valley, tare, auto zero and conversion of pressure units. Battery-powered and has an auto-shut off. 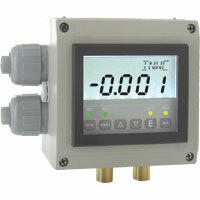 Digital Pressure Gage with 1% Accuracy is economical and monitors air and compatible gases. Applications include process applications, process start-up, and OEM applications. 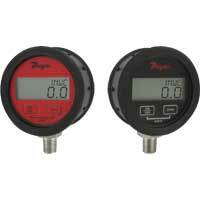 0.5% Digital Pressure Gage is easy to use unit at prices comparable to mechanical gages. This product comes with a protective rubber boot to protect against short drops and rough handling. 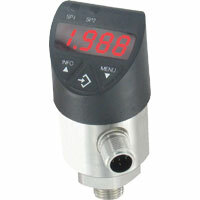 Digital Calibration Pressure Gage offers a complete pressure gage with calibration capabilities. Complete with 7 selectable pressure units, back light, and zeroing capability. Handheld Digital Tire Pressure Gage reads tire pressure. This lightweight and handheld design is user friendly and it is button operated. 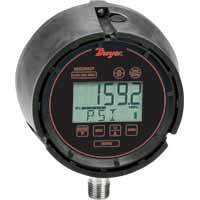 Brass Digital Pressure Gage measures gas pressure and is designed for specific applications of compatible gases. User-selectable units of measure let one gage be used for various pressure scales. 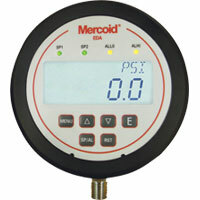 Weatherproof Digital Pressure Gage measures gas and liquid pressure. Applications include pneumatic, industrial, flow, HVAC roof-top, and outdoor. What would be the consequences of using a DPGA gauge on a water system instead of a DPGW? The DPGA can only be used for air and compatible gases. If you use the DPGA for liquid service, it will ruin the internals of the gage causing irreparable damage that would not be covered under warranty. The DPGW should be used instead for liquid applications. 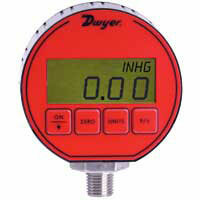 I have a DPG-200 Digital Pressure Gauge. I need to know if Dwyer can make them with a 90 Degree fitting or elbow, or with the fitting coming out of the back of the gauge? 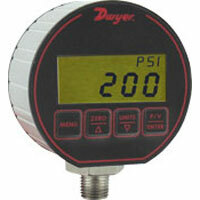 The DPG-200 Digital Pressure Gage is only available with a bottom connection. Having a back connection would not be feasible due to the electrical connection already existing at the back. However, one would have the option of connecting a Series A-2022 (purchased separately) SS elbow to the bottom connection.